Suitable for residential developments, LoĒ-180® delivers ideal cold weather performance with excellent insulation properties, no haze, high light transmissions and Neat® self-cleaning technology. Cardinal LoĒ-180® is available in standard 4mm annealed and 5mm Toughened. With a relatively high SHGC it will allow the winter sun to warm your home whilst blocking out the cold. The excellent insulating properties of LoĒ-180® will assist in preventing the naturally attained winter heat gain from escaping through the glass. Once incorporated into an insulated glass unit, LoĒ-180® can be combined with a variety of other glass products for privacy, sound attenuation or to meet energy regulations. 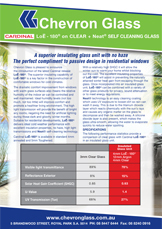 Neat® technology is an easy cleaning coating which uses UV exposure to loosen dirt so rain can wash it away. This is due to the titanium dioxide layer which reacts chemically with the sun’s rays and causes any organic matter on the glass to decompose and then be washed away. A silicone dioxide layer is also present, which makes the glass ultra- smooth, allowing the water to evaporate quickly to reduce water spotting. 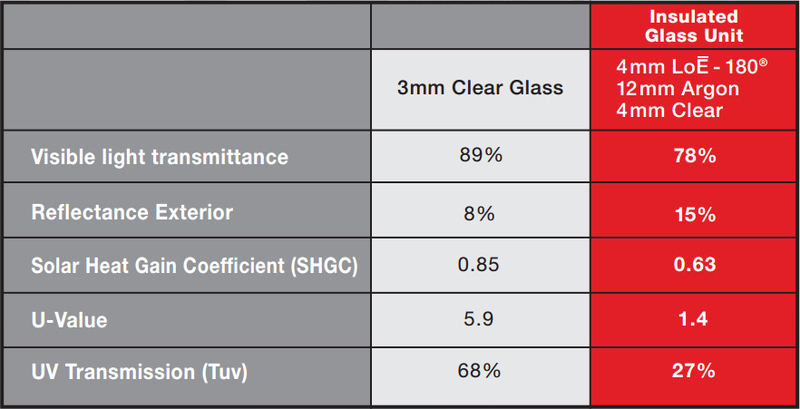 The following performance statistics provide a comparison of clear glass with Cardinal LoĒ-180® in an insulated glass unit.